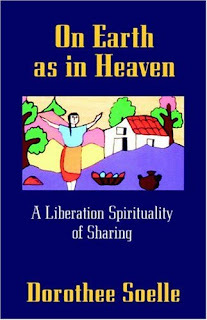 I just started reading a really short but really good book called On Earth as in Heaven by Dorothee Soelle, a German theologian whose writing is in many ways driven by the memory of Nazi Germany. She offers the idea of an eschatological and soteriological hope for a freedom which is not disconnected from the bodies and blood of the here and now or in our history and which is not separated from the action and vision of real people. I recommend this quick read to you in this season of Lent. "'On Earth as in Heaven' is a prayer, not a statement. It claims our hope for this world and for ourselves: there will be a time when God's will or dream will be done not only in God's realm among the cherubim and seraphim but on Earth among principalities and powers as well.To pray does not mean to ask someone else to fulfill, instead of us, what we cannot bring forward. It means to cooperate with God, it asks that we may be empowered and commissioned. We may say God has a dream about us humans; in prayer we end letting God dream alone, we participate in God's dream, we join." That quote is really exciting Wes. I really like the sound of what she's saying, I really want to read you paper about this book.